Federation Of Fear 8 est arrivé. Il raconte ce qui se passe après la trahison de Takadox pour l'équipe. Brutaka pushed aside a pile of rubble and struggled to his feet. Around him, Spiriah and Roodaka were using shadow energy to blast themselves free. Vezon and Lariska were nowhere to be seen. He glanced back toward the now blocked tunnel entrance. A few blasts of power would no doubt clear away the pile of rocks and stones, but Takadox would be long gone by now. There would be time to settle with him later. Brutaka turned to see Lariska holding a squirming Vezon by the throat. "I caught him sneaking down a side tunnel," the Dark Hunter said. "Let us track down that traitor," snarled Roodaka. "I want his shattered body beneath my heel." "We're here to do a job," Brutaka replied. "We keep moving. All of us," he added, looking hard at Vezon. The tunnel proved to be far more than a mere pathway. It opened upon a vast underground cavern spanned by a narrow bridge made of fibrous protodermis. Down below, the floor was littered with a massive tangle of what looked like dead branches intertwined with each other. Deep channels had been carved into the walls by lava flows over the centuries. Strange flying Rahi hung from the ceiling, their six eyes blinking slowly at the sight of intruders into their realm. 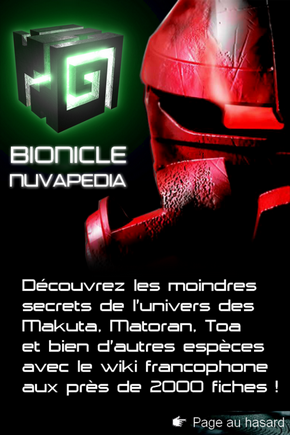 "Remind me not to let Makuta Krika arrange for my next pleasure trip," muttered Spiriah. "This whole island is volcanic," said Brutaka. "Minor eruptions over the years, but nothing major. Tahu and Kopaka are supposed to have taken care of the problem. Otherwise, we would probably be flash fried by now." "No Carapar, no Takadox," said Vezon in a sing-song voice. "Who will go next? Spiriah the Sullen? Brutaka the Boorish? Vezon the Vanquisher? Or Lariska --"
The Dark Hunter whipped out a dagger and flung it into the stone right at Vezon's feet. The mad half-Skakdi turned to her, smiling, and said, "Or Lariska, the wise, wonderful, and gloriously homicidal." Brutaka led the way across the bridge. At the far side, light spilled through a narrow opening. The symbol of the Brotherhood of Makuta was seared into the stone beside that portal. Someone – maybe Krika, maybe Miserix – had marked their path, so long ago. "What are we going to do with this legendary Makuta when we find him?" asked Roodaka. "What makes you think he will help the likes of you?" "Miserix hates the Brotherhood for turning on him," Brutaka replied. "He would ally with three Matoran and an Ussal crab if it would get him revenge on his fellow Makuta." "And so what will he be for you?" Roodaka pressed. "A general? A hero? A symbol around which to rally resistance to the Brotherhood?" Brutaka shook his head. "Nothing quite so grand. He'll be a weapon, like a Rhotuka launcher or a ghost blaster. And we're going to aim him right at the Makuta fortress on Destral." Roodaka smiled. "And who, might I ask... are 'we'?" Brutaka smiled back, the grin of a Kavinika about to feast. "Now, now ... what you don't know won't cut you in two and dump you off this bridge." "I hear something," said Lariska. "Up ahead... it might be a voice... or the rumble of the volcano." "I hear something too," said Vezon. "And I see something as well," Vezon continued. "But since you aren't interested..."
"Personally, I always find my comments and observations most interesting," Vezon rambled on. "You haven't truly lived until you have seen the world through the eyes of madness. Why, half the time I don't know if what I see is what's really there, or what I wish was there ... or what I pray, I beg, I plead is not." "Why did we bring him again?" said Spiriah. "He breaks up the monotony," said Lariska. "I'd like to break something much more satisfying," hissed Roodaka. "I hear Skakdi make a most appealing sound when you snap them into pieces." "But, since you seem to have no interest," Vezon continued, utterly disregarding his teammates' comments. "Well, then, I won't tell you that the floor is moving. You can find out on your own." "The floor is...?" Brutaka repeated. He looked down. Far below, the tangled growth of dead branches had indeed begun to shift. The reason why rapidly became clear: they weren't branches at all, but the twisted limbs of thousands of crimson insects, now disentangling themselves from each other. Apparently, it was time to wake up and they were ready for their morning meal. Swifter than anyone could have predicted, they began to swarm up the walls of the canyon on every side. In an instant, they had blocked the openings on both ends of the bridge. The surrounding rock was now gone, buried beneath a skittering sea of red and thousands of unblinking, predatory eyes. "No, no, no," said Vezon, shaking his head. "Too late to apologize. Much, much too late." Après la fuite de Takadox, les cinq restants cherchèrent un moyen de s'échapper. Ils réussirent à s'échapper dans un long chemin de branches, mais Vezon tenta de les trahir. Il fut cependant arrêté par Lariska. Brutaka donna quelques explications au reste de l'équipe en ce qui concernait les volcans, dont l'activité fut arrêtée par Kopaka et Tahu. Vezon énerva toute l'équipe au long du chemin, avec de nombreuses remarques inutiles, mais fit remarquer finalement que le sol bougeait. Ils remarquèrent plus tard, que ce n'étaient pas des branches tombées, mais des insectes, qui, en un instant, avaient recouvert toutes les sorties possibles. La promotion Brickmaster est de couleur Blanche/Gris/Argenté et ne ressemble pas à un insecte. Dans FoF ce sont des insectes rouges qui apparaissent. c'est pas les insecte de lave du mangai non ???? Encore merci d'avoir posté la news Zeuboss, ça m'a bien dépanné ('avais vraiment pas l'temps) Ouaip, bah pour mon opinion personnelle, ce chapitre es loin d'être le plus interessant. J'attends encore le chapitre 9, qui sera sûrement un des plus intéressant avec leur rencontre face à Miserix. Ouaip, mais je ne pense pas que ce soit Miserix qui en voudra à Takadox, il a bien livré toutes les informations nécessaire pour l'attaque de Teridax à l'époque. Donc à mon avais, c'est plutôt par peur que le reste de la fédération découvre le fameux contrat et le reste.